I started out (age 13) as a guitar player (electric and acoustic). Later on, I focused on classical guitar performance and composition (CALARTS, Valencia and California State University, Northridge). My first encounter with the LUTE, was listening to Hopkinson Smith playing Weiss over the waves, as I was driving to school. 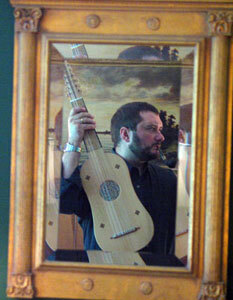 From then on, lute became more than an interest, it became my passion. Parallel interests in sculpture and poetry, along with repeated sojourns in Europe in my 20s, led me to a violin maker’s door in Bourges, France. That moment my professional life took a different path, as I stayed and apprenticed with Master Luthier J. Gonthier, for the next three years. Back in the United States, I built and restored violins for a number of years, while privately pursuing lute playing. My dissatisfaction with my first lute motivated me to start building my own instruments. Encouragement and advice from performers and teachers (chronologically, Pat O’Brien, Edin Karamazov, Hopkinson Smith, Olav Chris Henriksen) led to my turning into a full time lute maker. While respecting historical building techniques and materials, I strongly believe that lute making is a living craft/art. Clearly, the construction of the instrument evolved continuously over the centuries, driven by new musical styles and performers’ needs. As part of this evolutionary process, I’m always searching for the “ideal” sound, and I try to achieve that with every new instrument that I build. I also do listen to the Musicians’ request of various qualities of timbre, a brighter or mellower tone.